Although Stanislas Lépine participated with three paintings in the first public display of the Impressionist group, the famous exhibition held in the boulevard des Capucines in April 1874, he was never an Impressionist painter. 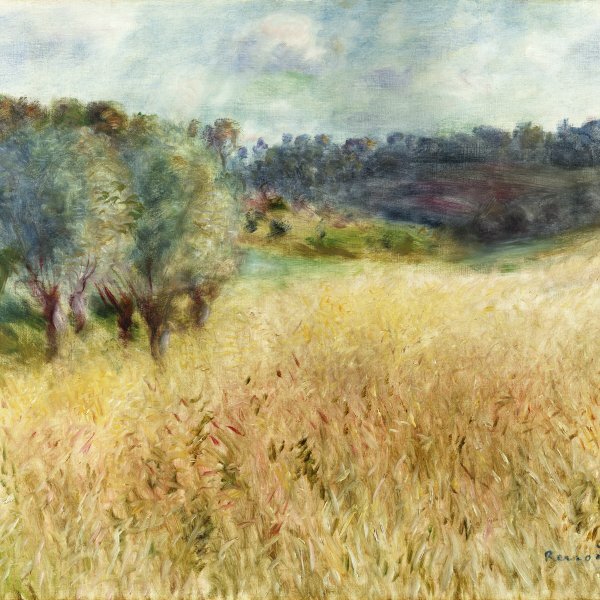 He did not aim at representing the plein soleil with the bright effects typical of Impressionism; he always remained faithful to a tonal pictorial language, with a subdued range of colours. In his submissions to the official Salon, he was described, from 1866 onward, as a "disciple of Corot", a master he deeply admired, and all the critics perceived in his oeuvre this devotion. Jonkind's influence can also be detected in his views of the Normandy ports and that of Daubigny in his river landscapes. Lépine's painting shows little development after the 1860s; this, added to his habit of not dating his works, makes it very difficult to arrange his oeuvre in chronological order, although it can be divided into three main groups according to the subjects. In the first place, we have the Caen and Rouen ports and, in general, the Normandy coast. In the second, the landscapes around Paris, particularly of the bank of the Seine and the Marne. The third group comprises urban views of Paris, chiefly of the river, its quais and bridges, but also of the streets of Montmartre, where Lépine lived for many years. In the catalogue raisonné of the artist's oeuvre, this small panel appears together with two other versions of the same subject (and with the same title) painted around 1878-1880: one is a sketch on panel (24 x 14.5 cm) and the other a larger canvas (56 x 18 cm). The small size of the painting we are analysing here does not mean that is it is insignificant or that is does not reveal the author's talent. As his contemporary critics observed, it is precisely these small sketches that bring to light Lépine's best qualities-spontaneity and a delicate execution-which usually disappear when he enlarges his studies to execute paintings to be submitted to the Salon. 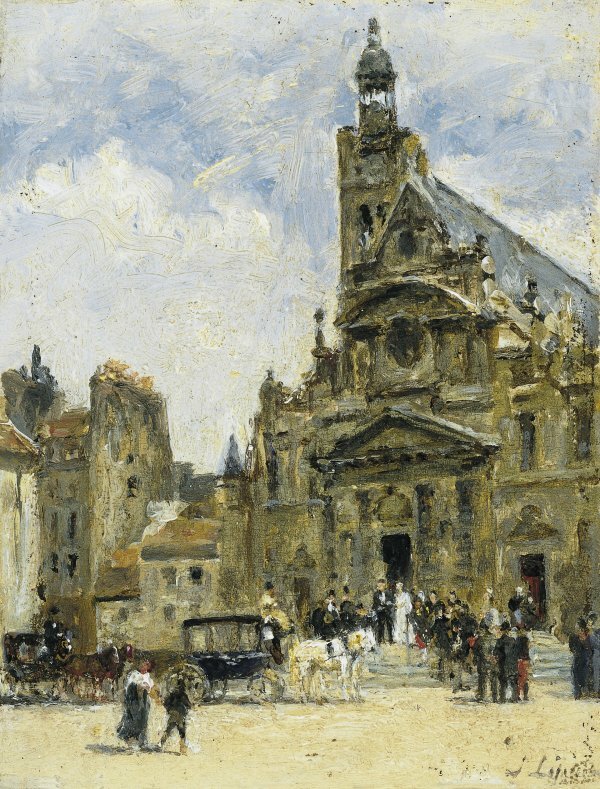 From the subject point of view, Wedding in St. Étienne-du-Mont announces the shift that would take place in Lépine's art in the 1880s. In fact, in those years he painted a series of views of Parisian parks and gardens (Trocadero, Luxembourg, the Tuilleries) where he showed an interest in anecdote, very unusual in him up to then: couples going for a stroll, schoolchildren playing, nannies with young children, etc. This Wedding in St. Étienne-du-Mont also contains an anecdotal, even sentimental, component, although our distance from the scene blurs its details. The architecture determines the composition of picture. With this in mind, Lépine uses in this case a vertical format and a dynamic scheme in the form of an upward arrow (a very unusual choice in his landscapes). The wedding guests are distributed along the church steps, echoing the staggered profile of the facade. As for the facade itself, Lépine overlooks the details and offers us a synthetic vision of the masses of the three pediments. Its depiction would be halfway between a precedent of classical virtues, such as Corot's Chartres Cathedral (1830) and the dissolution of architecture in the Rouen cathedral series painted by Monet in the 1890s. The church of St. Étienne-du-Mont (whose original construction, from the 13th century, was renovated and enlarged in the 16th century) had been built next to the chapel of the abbey of Sainte Geneviève; when the latter was destroyed in 1807, its facade was left free-standing, showing its present curious asymmetrical layout. Lépine uses this asymmetry, combined with the city's skyline, to frame an area of empty sky where he recreates, with white, blue and pearl grey shades, the soft and suffused Parisian light which always captivated him.